Restorative dentistry has advanced at a great pace in the past decade, offering a myriad of new and updated materials that are stronger and more aesthetic than ever before. Dentists are now able to deliver more natural-looking and durable restorations, which continues to raise expectations for patients. In order to meet these aesthetic and functional requirements, dentists need a cost-effective material that isn’t technique sensitive for dental laboratories to deliver at a consistently high standard. At the forefront of dental materials research and development, GC America has created a formidable duo in G-CEM LinkForce and GC Initial LiSi Press that achieves not only beautiful but durable restorations. On the one side, G-CEM LinkForce is a dual-cure adhesive resin cement for dentists, which is aesthetic and stable with multiple indications. On the other side, dental technicians have the pleasure of working with GC Initial LiSi Press, a new high strength lithium disilicate ingot with High Density Micronization (HDM) technology which results in advanced physical properties and the most aesthetic pressed ceramic option on the market today. When used together, studies have revealed exceptional tensile bond strength, in comparison to Ivoclar Vivadent’s IPS e.max Press and MultiLink Automix*. 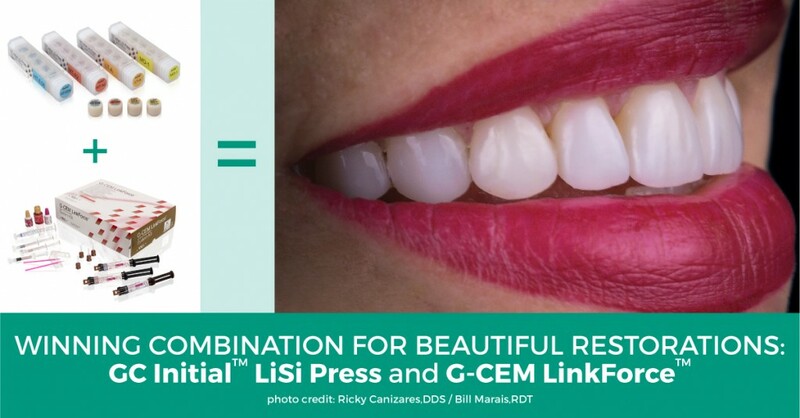 For dentists who want to create beautiful restorations that will last, using GC Initial LiSi Press together with G-CEM LinkForce will give you the desired outcome. Here is an overview of why you should use G-CEM LinkForce and GC Initial LiSi press for all your restorations. G-CEM LinkForce is a multi-purpose, dual-cured, radiopaque, universal adhesive resin cement system. One convenient kit is all you need for all restorative procedures, from lithium disilicate, ceramics and hybrid ceramics, as well as zirconia, PFMs and precious metals, glass fiber posts, and veneers. Key features of G-CEM LinkForce include beautiful aesthetics, with good consistency of shades. Translucent, A2, Opaque and Bleach are the four shades available, with tooth-like fluorescence, convenient automix delivery and matching try-in pastes. The material offers ideal working times and good viscosity and uniformity of the mix. It is easy to use and to clean up. This system also includes a dual-cure activator, allowing the light-cured primer to be used in areas where a curing light may not have sufficient access. GC America has recently introduced GC Initial LiSi Press, a new high strength lithium dislocate ingot with High Density Micronization (HDM). This proprietary technology provides advanced physical properties while obtaining the most aesthetic pressed ceramic open on the market today. Improved aesthetics results in more vital-looking restorations, happier patients, and fewer remakes, saving time and money in the dental office.The physical properties of GC Initial LiSi Press offer high strength, better marginal integrity, and superior polishability. The material is robust and stable and it wears down the opposing dentition at a much lower rate, so it’s safer for the patient. GC Initial LiSi Press is unique thanks to the development of HDM technology. HDM utilizes equally dispersed lithium disilicate micro-crystals to fill the entire glass matrix rather than using traditional larger size crystals that do not take full advantage of the entire matrix structure. As result, GC Initial LiSi Press is the ultimate combination of strength and aesthetics making it suitable for all types of dental restorations. Most importantly, this technology allows the product to be extremely stable and strong, without distortion or a drop in value. GC Initial LiSi Press is also optimized to be used with the already proven GC Initial LiSi veneering ceramic to provide patients with the strongest, most aesthetic, and stable option available. What this means to you is a reduction in failures and remakes, and a more aesthetic and stronger option for your patient. Both G-CEM LinkForce and GC Initial LiSi Press have been rated highly in the dentist and dental technician communities for their superior properties and ease of use. G-CEM LinkForce received a rating of ‘excellent’ by The Dental Advisor Editor’s Choice. The product was evaluated by 26 consultants who found it to be a complete and versatile system for multiple applications. It was lauded for aesthetic results in terms of consistency of shades, as well as good viscosity and low film thickness. It was further commended for its great consistency of mix, being easy to use and clean up, as well as having excellent laminated instructions for use. Clinicians who have trialled both products have praised the aesthetic and durable restorations they create. One team, consisting of Dr. 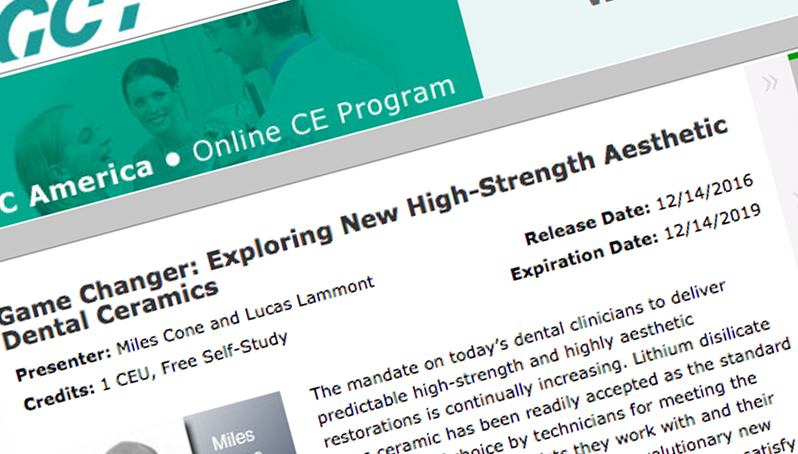 Miles Cone, Prosthodontist and Certified Dental Technician and Lucas Lammott, Dental Lab Owner and Technician, recently delivered a webinar ‘Exploring New High-Strength Aesthetic Dental Ceramics’ in which they showcased the results of clinical cases where they have combined GC Initial LiSi Press with G-CEM LinkForce. About the webinar: The mandate on today’s dental clinicians to deliver predictable high-strength and highly aesthetic restorations is continually increasing. Lithium disilicate glass ceramic has been readily accepted as the standard restoration of choice by technicians for meeting the expectations of the dentists they work with and their patients. With the introduction of revolutionary new lithium disilicate systems, additional options to satisfy the demand for improved treatment outcomes are now available to the dental laboratory technician. This CE webinar will utilize several case studies to illustrate the range of indications and benefits that these new high-strength materials possesses and to demonstrate how they are positioned to change the game for this class of dental ceramics. Ask your lab to start using this breakthrough new material, GC Initial LiSi Press, to give your patients the most life-like restorations that will last, thanks to the adhesive strength of G-CEM LinkForce. Countdown to GC’s 100th Anniversary!